This has been a Runsk-terrific weekend. Yesterday, our queen of speed, SIOR, hosted a great dinner for our small group, including grownups and kids ranging in age from 2 to (almost) 16. The food was great, the company was great, and the energy level was high. TPP and I finally got to meet Mr. SIOR, who was a personable and welcoming host, and their fantastic, adorable kids. It turns out that Mr. SIOR and I have some friends in common. What are the chances of that?! Earlier in the day on Saturday, I went out for 5.7 miles around my neighborhood. My new schedule makes it difficult for me to run during the week, so I needed to cram some mileage into the weekend. The run itself was unremarkable, though I worried that a mid-length run on Saturday might affect my running performance today. There are a number of reasons why I fell short of my planned distance of 12 miles today, and that could have been a factor. Today's Mother's Day long run started in different places for the Runsketeers. 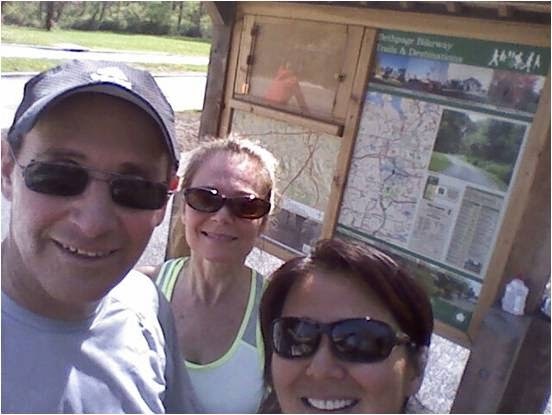 TPP and I met along the bike trail north of Haypath Rd with the goal of eventually meeting up with SIOR, who was starting her run at the southern end of the Massapequa Preserve. TPP and I ran north and turned around when we reached the point where I'd calculated that our southern direction would get us to the Bethpage lot in time to rendezvous with SIOR. For different reasons, the timing had us at Bethpage earlier than expected. Me and TPP waited about 10 minutes before resuming out southern direction with the intention of intercepting SIOR along the trail. We all met up at the bottom of the big hill right before the lot, and ran north, making a brief stop at Bethpage. We all got water from the fountain because, while it was relatively cool, it was extremely humid. The two "rests" along the way may have contributed to a degradation in my ability to maintain pace. In retrospect, I think it was my failure to bring a water bottle that made my last miles very difficult. We ran further north and I watch SIOR grow steadily smaller as she opened up space between me and TPP. TPP was able maintain a better pace than me and I followed about 30 feet behind her until we met up with SIOR who was waiting for us at Old Country Rd. SIOR suggested taking a picture at that point, which was a good idea since we often forget to do that. It would have been great to get a selfie at dinner last night, but we never got to it. I think that's because we were having too much fun to think about it. Shortly after we took our pictures, I reached the point where I needed to stop running. SIOR continued all the way to Sunnyside Boulevard (mind blowing, considering all the miles she'd already covered and the challenging hills north of Washington Ave). TPP ran another mile and met up with me where I'd stopped. After she returned, we started walking back to our cars knowing that SIOR would eventually catch up. That happened about a mile north of where we parked, so the three of us got to have a nice talk without anyone worrying about finding an oxygen tank for me. I ended up covering 9.6 running miles, plus those walking miles at the end. 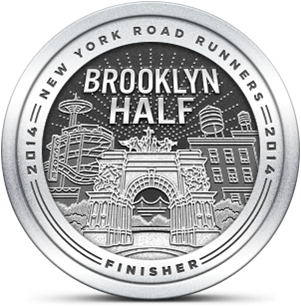 I wanted to finish my Brooklyn training with 12 miles, but I didn't quite get there. I think with a resting taper, carrying water and maintaining a consistent pace next Saturday, I'll be able to get through the distance. There's no way I'll PR and there's a good chance I won't beat my original half marathon time when I ran with an injured knee. But Brooklyn is about the experience and being with friends. I hope they won't mind waiting for me at the end. Indeed. And it could be a pretty long wait for me. It was a fun weekend filled with my favorite running pals. It was great to get the families together. I'm not sure how "cool" it was at 80 degrees. I think we did fine. You did great considering your binge drinking from the night before. I think you should do a shakeout run Friday, if you have the time. Short and sweet, like 3 miles. I always feel I perform better with "loose" legs. I forgot about downing that whole bottle of light beer! Was it really 80° this morning? That helps explain my dehydration. I like the idea of a shakeout run on Friday. The challenge will be fitting it into my schedule. Maybe an elliptical session will work better. Nah. If you can do the elliptical, you can run. Doing 12 before a half is nice, but not really necessary. Race day magic is a real thing! Not saying training's not needed at all, but you've put in the miles, you'll be ok! Thank you Di. I know you run long distance races and understand how to train for them. I feel good about my training in terms of covering the miles. But zero expectations in terms of performance.